Buffalo River Fest Park has unveiled the 2019 Buffalo River Fest Park summer concert schedule. This popular and family-friendly waterfront music series presents its ninth season of Wednesday evening performances from 6:30pm until 10pm, beginning May 29th and running through September 4th. 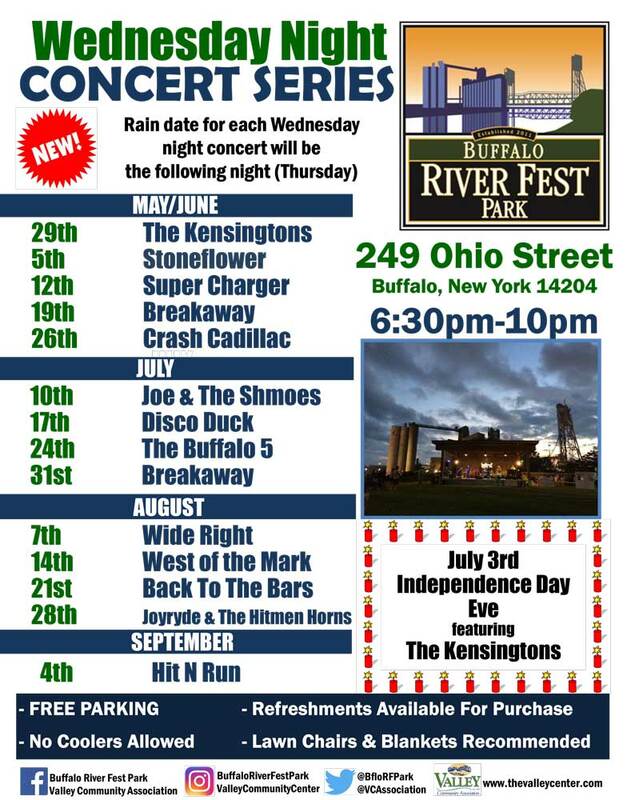 The Wednesday Night Concert Series will feature some of the best local bands playing against the backdrop of the historic Buffalo River and grain elevators. For a full schedule of concerts and events visit www.thevalleycenter.com. New this year will be a built in rain date policy. In the event of a Wednesday night cancellation due to weather, the concert will be held the following night on Thursday at the same time. The concert series kicks-off with versatile band “The Kensingtons” on May 29th, followed by concert series newcomers “Stoneflower” on June 5th. “Super Charger” performs on June 12th while “Breakaway”, who play both current and classic hits, appears on June 19th. One of the area’s premier live oldies band, “Crash Cadillac”, hits the stage on June 26th to close out the month. Versatile rock band “Joe & The Shmoes” make their Buffalo River Fest Park debut on July 10th while ‘70’s band “Disco Duck” are set to perform on July 17th. “The Buffalo 5” take to the stage on July 24th and “Breakaway” makes their second appearance of the season on July 31st. “Wide Right” takes to the stage on August 7th and local country music favorite “West of the Mark” are scheduled for a performance on August 14th. Classic rock band “Back To The Bars” makes their Buffalo River Fest Park debut on August 21st and “Joyryde & The Hitmen Horns” also perform for the first time at the park on August 28th. The concert series will conclude on September 4th with the perennial favorite – Hit N Run. The annual Independence Day Eve celebration fundraiser will be held on Wednesday, July 3rd and will feature “The Kensingtons” from 7pm-11pm. Buffalo River Fest Park is located at 249 Ohio Street, Buffalo, NY 14204. Parking is free and widely available. No personal coolers are allowed at the park; however, refreshments are available for purchase, with proceeds supporting park maintenance and other riverfront development efforts. Lawn chairs and blankets are recommended. Rain will force concert cancellations, so please check the Buffalo River Fest Park Facebook page for updates.